One of the problems today with most home security companies is that they are not up front on their websites about how much the equipment and services will cost. Vector Security does provide some information, but we had to do a little digging to provide more details of what you would pay for if you signed up to receive home protection from them. By the way, seeing the pricing guide on Vector’s website requires filling in the name, email, address, phone number and zip code. This can be slightly annoying to customers, but at least they do provide the info. This plan as well as the upgraded plans also include SecurityCare Plus along with yard signs and window decals. Vector does also have two additional pricing tiers. One of them is a home automation plan that also requires no down payment up front. This plan includes all the basics plus mobile phone solutions along with appliance and lamp modules. Customers also have the option to add a camera and a lock for an additional $10 each per month. Vector also has a Connected Home plan that requires $99.00 down. 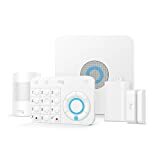 This advanced plan includes all of what is in the Basic and second-tier Home Automation plan as well as an indoor camera, door lock and thermostat. Vector Security does provide the benefit of a somewhat “A La Carte” service, which does give customers some freedom of choice. However, having so many options could be confusing to customers. It is a good idea for customers to make sure they understand all the costs associated with setting up a home security system. Protect America also provides many options for homeowners for no upfront costs at all. That is what sets us apart from many of the professional and DIY alarm companies out there. You can receive basic monitoring from us for as low as $19.99 per month. Basic features not enough? You can also request a free quote from Protect America concerning upgraded smart home security options that will provide you even more protection all day and all night. Contact us today to have all your questions and concerns addressed.